Bay Beans Ristreto coffee capsules for Nespresso is delicious as both a black coffee or as a milk based coffee. Dark roasted, giving maximum crema, full of sweetness and body. 100% Arabica coffee beans from South America. 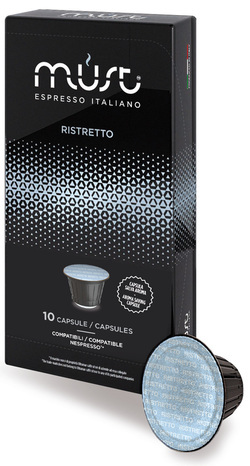 Buy Bay Beans Ristreto coffee capsules for Nespresso. We recently purchased a Nespresso machine for our office and found the capsules price was quite varied over multiple sites. We ended up going with these guys for the price, personal touch and quality which was amazing. Received our coffee capsules for our Nespresso machine within 24hrs. Thank you Baybeans.